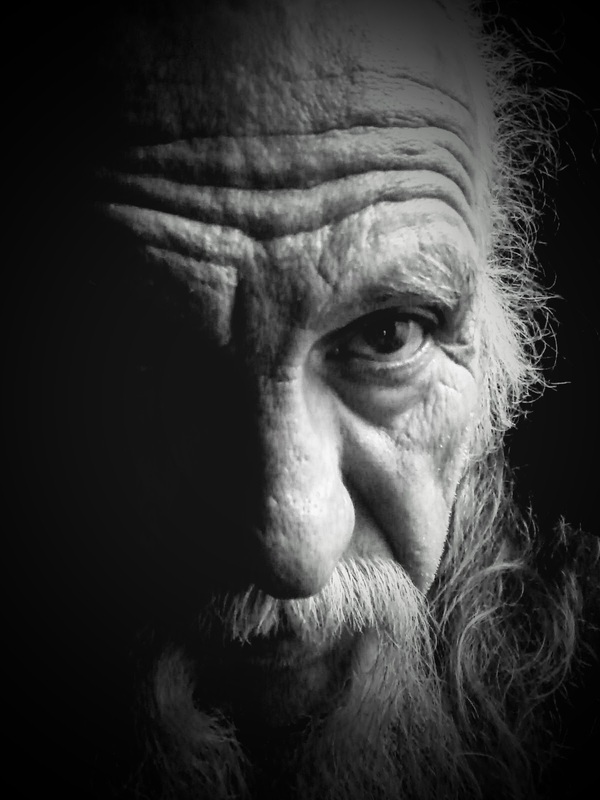 Milgram was a psychologist who performed a series of experiments that proved conclusively that obedience to authority was so ingrained in the average US citizen they were prepared to cause lethal harm to others when instructed by authority figures to do so. All those who took part were first asked if they would be capable of killing or inflicting severe pain on their fellow human beings. 100% replied categorically 'no'. Today I am going to be showing 2 different wasps. 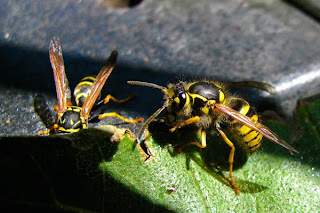 The Yellow Jacket and the Paper Wasp. 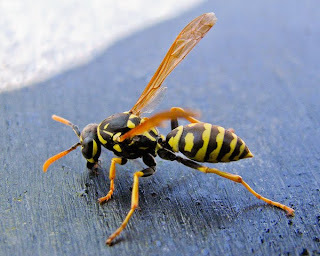 Fortunately, we don't have very many Yellow Jacket wasps buzzing around our house. We have lots of the Paper Wasps, Muddaubers, and various other rather shy wasps. When I say "shy wasps" that doesn't mean that they won't sting. It just means that if we as humans are not near or threatening their nests they have no reason to bother us and will usually fly away. They will even avoid being close to us unless they don't notice that we are there. Yellow Jackets are not that way. They are aggressive towards anything that may become food. That includes any mammal, fish, reptile or insect. I have found them building nests in animal carcasses and eating the carcass. 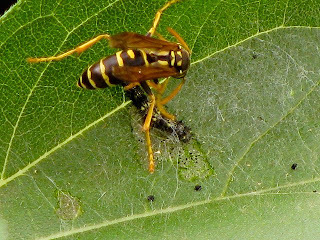 A typical Yellow Jacket trap uses the smell of dead and rotting meat as an attractant. This kind of attractant will not attract any of the other wasps that I have seen around our house. I tested that. This first image is of the typical paper wasp that has built numerous nests around our house. I have been constantly getting rid of the nests that are too close to our regular paths and children's play areas. If I could find a way to make an area where they could nest away from our house I would do that. 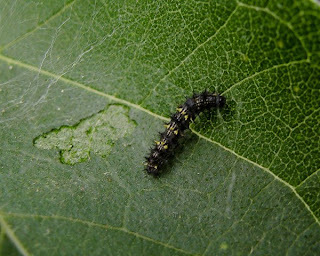 I have witnessed them collecting bugs out of our garden to feed their larva. An interesting article about the food collecting and what wasps actually eat by the National Geographic is here. 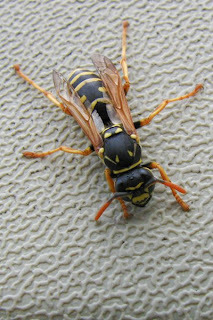 This second photo shows a Paper Wasp on the left and a Yellow Jacket on the right. 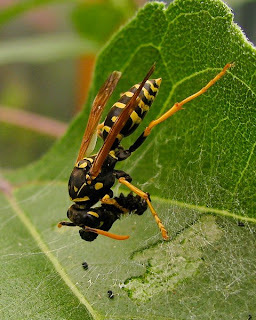 Notice the Abdomen shape and size with relation to the rest of the Yellow Jacket body and compare that with the Paper Wasp in the first photo. Note also the posture of the two. These are typical differences. However it is not easy to discern the two unless you are around them all the time. Our family owns some property north of Williams and it is Yellow Jacket country. That is where I've seen them eating and nesting in carcasses. They are aggressive and constantly looking for fresh meat and will invade any picnic if food is out. A good article on how to build a Yellow Jacket trap is here. 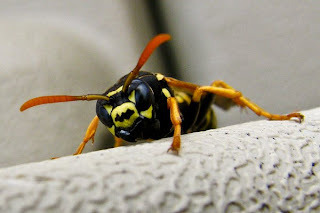 Thanks for reading this and hope it helps in understanding wasps a bit more. 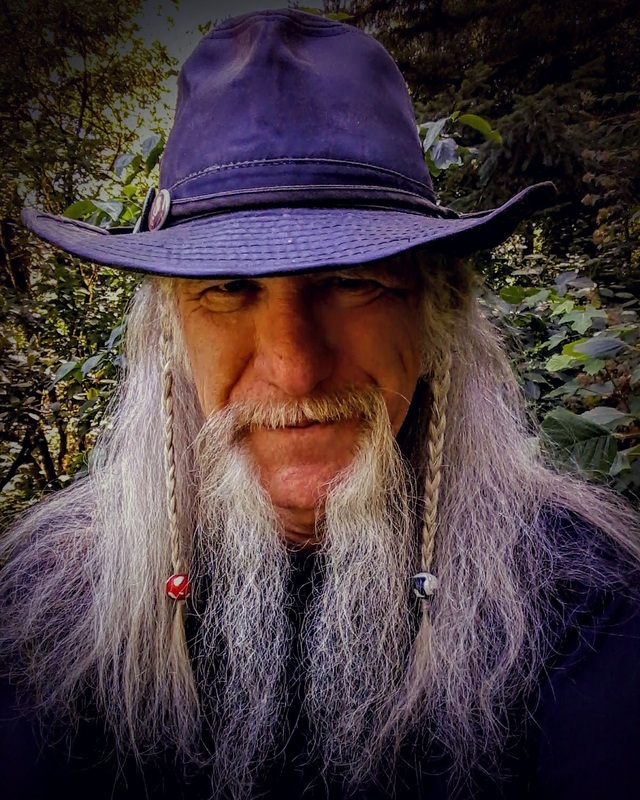 Before I begin this blog, I have to explain a few things about myself. I do not enjoy destroying any life. As a human I have to maintain a certain lifestyle that includes protector of my wife, grandkids, and pets. Because of this roll in life, I have to do things against my normal character. That said, here are my observations. We have a large number of wasps visiting our yard. Most of them are the paper wasp and mud dauber variety. We have the occasional Tarantula Hawk, hornet, and other very large ones come in and visit, but most are the smaller ones. 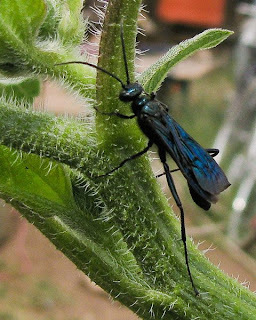 There is a metallic looking black wasp with black wings that is about the size of a mud dauber, a little larger than the paper wasps, that visits regularly, but it is usually a single wasp. 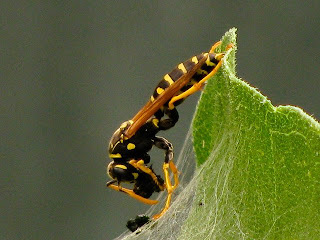 The paper wasps are so prolific that they have started making nests very close to where my grand kids and I have to work and play. I was noticing that the paper wasps were getting riled rather frequently. Every time I went into the work shed, I had a bunch of them start buzzing around anyone who was outside. They had built their nest inside one of the hinges of the shed. The shed is a Rubber Maid shed so has lots of spaces in many parts of it, especially the hinges. So whenever I touched the shed it vibrated their nest and they would start harassing all the larger animals. That nest had to go. A couple of days after I had found and destroyed the nest I found a wasp just sitting on the opened hinge (I actually disassembled the hinge). Its antennae was down and body against the plastic. As I was watching it another wasp would fly up to it, wrap its legs around the one on the hinge and then let go and fly away again. This happened several times with the wasp on the hinge not moving. I took several photos but was unable to actually photograph that behavior. The only time the wasp moved was when I got to within 1/2 inch with my camera. Then it would either raise its antennae or move away a little bit, then return to its same posture. 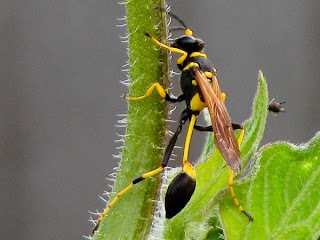 It appeared to me that the wasp was feeling loss or sadness, complex emotions for an invertebrate. Observing that behavior, I actually felt a bit of remorse for destroying its nest/home/residence. It is not the wasps fault, they actually found a perfect place to make a nest. It was protected from the weather and other predators. And the snow never reached that high last year. And here is another reason for a bit of remorse for having to destroy the nest of a very complex creature. 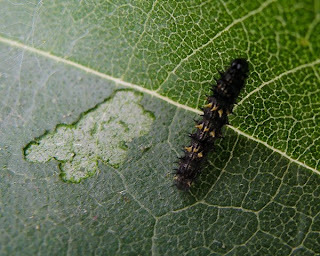 This worm (caterpillar) had been eating the sunflower leaves. If the egg had been laid on one of my garden vegetables, it would have done the same as it did on the sunflower. The worm was spinning a web for protection and I was wondering why the wasps hadn't done anything to it. After awhile later I came back to the sunflowers to get more photos of the mud daubers that were flocking in on them when I noticed this paper wasp. It was dancing around trying to make a hole in the worm silk. It spent quite a bit of time for an insect to get to the worm but was finally successful in extracting it. The wasp had to pull the caterpillar out of the silk. The caterpillar was of course struggling to get away the whole time. What surprised me was that the wasp never once stung the caterpillar. Then the wasp chewed the head off of the worm, dropped it, and rolled the worm into a small ball and flew off, I presume, to the nest to feed the family. I have watched wasps in my garden walking around inside of holes in our vegetables looking for their prey. I have to leave the greenhouse door open so it doesn't get too hot and the wasps are welcome in there. They buzz around me all the time when I am in there. I am looking for vegetables to pick for dinner and they are looking for their dinner.